Aether... red tones, black background, some purple details...This year the darkness has come to stay in this deck of cards. Let's Feel the Shadows of the Universe! New finish, new design, new qualities, and new feelings. - 52 playing Cards + 2 jokers Poker size. - Black Matt tuck box. - Legendary Finish. Luxury paper stock. - Totally personalized. - Printed in Taiwan. 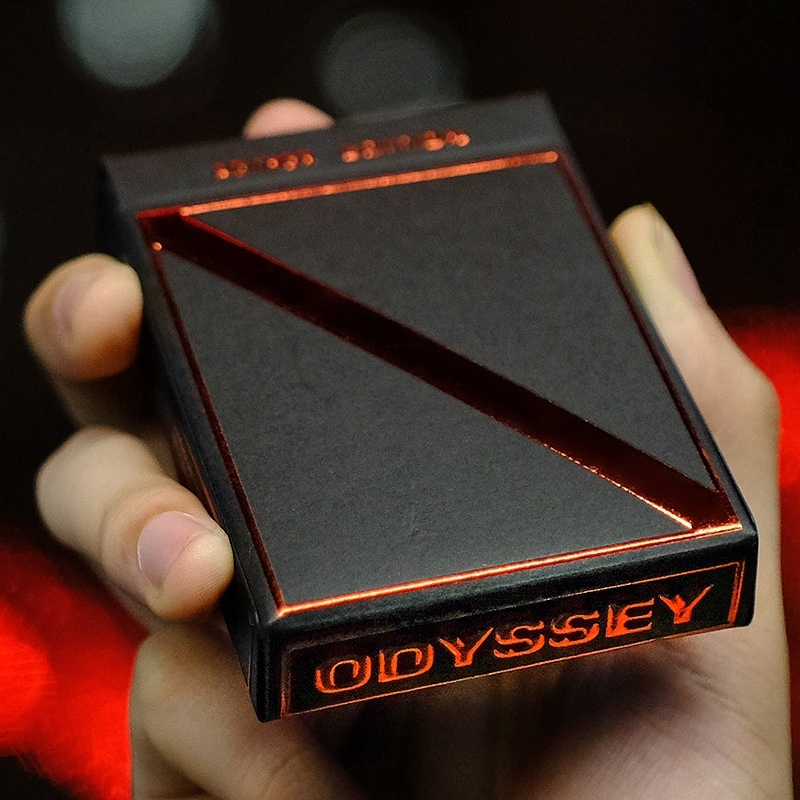 - Produced by Hanson Chien Production Co. Odyssey Aether Edition is crafted with one of the best paper stocks in the world, Luxury paper stock. This brand new paper is thinner and softer than the Classic paper stock used for the First Edition. It was also used in Odyssey Boreals. This stock gives you more comfort and is easier to control when you perform flourishes that require some bending techniques like springs, pressure fans... something very appreciated among Cardists. The finish of the Aether Edition is the brand new Legendary finish used in the Soda Cracker Playing cards. Legendary Finish is the balance between the Magic Finish & Royal Finish, and once broken in, the Legendary Finish keeps its slipperiness for way longer, more durable. THE BOX This edition comes with a high quality tuck case. Black matt and red foil, a perfect combination. As the previous editions, it shows elegance and minimalism with some futuristic touches which express strength and presence. THE BACK Modern, elegant, futuristic, minimal and...dark. The new back design shows a new and unique red nebula that is inspired by the red aether from Marvel's Thor The Dark World film and comics. Also, the name of this edition is inspired by this red substance. New lines, new details...new feelings. THE JOKERS Same as the previous editions, the futurism stays in the shapes of the jockers. All of them are equal and subtle just perfect for you to perform your best routines as a magician. THE ACES They show pure elegance and a lot of style. The ace of Clubs, Spades, Hearts and Diamonds each of them with a unique style but not one of them is better than any other. Distant but close, this four cards are the treasure inside the deck. THE FIGURES This imposing and defending trio won’t leave you in blank if you have been able to contemplate their majestic presence in your hand. • The cards are poker size.